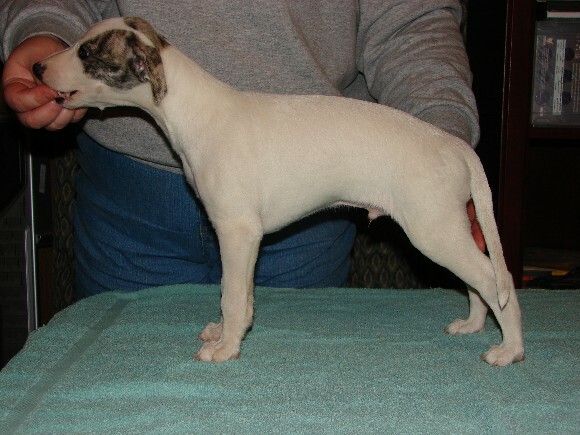 Our little butterball is starting to look like a whippet! Solo is six weeks old now! 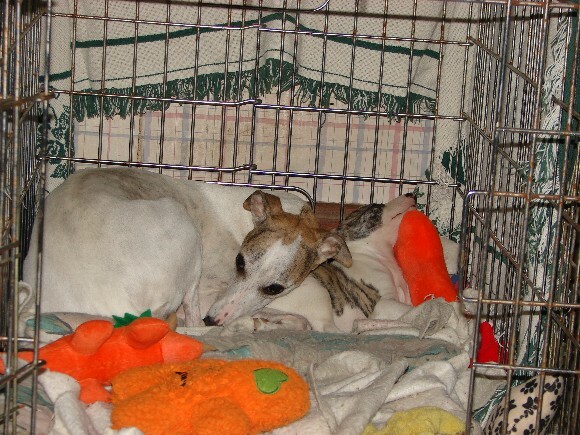 He has started eating a little softened kibble 3-4 times a day, but he's still nursing, too. Dena doesn't seem inclined to wean him, and still spends a lot of time with him. Don't they look sweet cuddled up together? 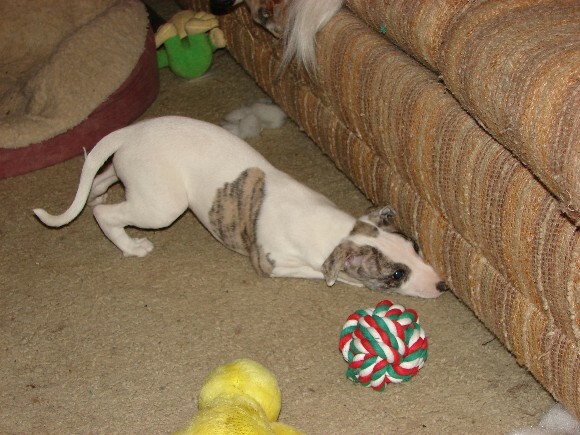 Is there something stuck under the couch? There might be! It could be a small toy, a bit of fluff from a de-stuffed toy, or one of my sons' socks. <sigh> Sometimes Solo decides to play with Uncle Smooch's tail, and gets fussed at, and sometimes he barks little high-pitched puppy barks back at Smooch, which is hysterically funny! Smooch still loves to sniff and nuzzle Solo, but doesn't appreciate sharp puppy teeth biting his feet or pulling his hair - imagine that! Since Solo doesn't have littermates to play with, he doesn't like to stay in his pen except to sleep and at meal times. He cries to be let out, and runs over to the place where the pen opens when someone goes to un-hook the pen. He loves to play with his mama, cousins and honorary uncles. 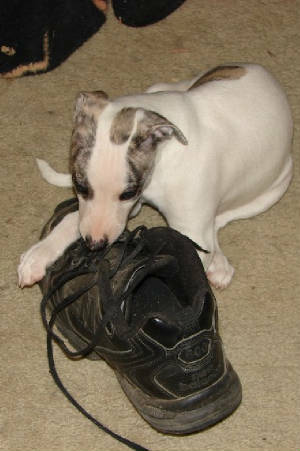 Solo is a very good boy, and would never do anything bad like chew on one of Bill's shoes - oops!!! 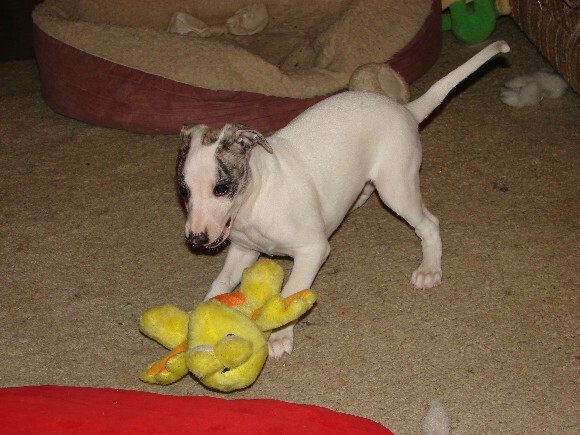 Crazed wild animal attacks innocent yellow dino stuffie! 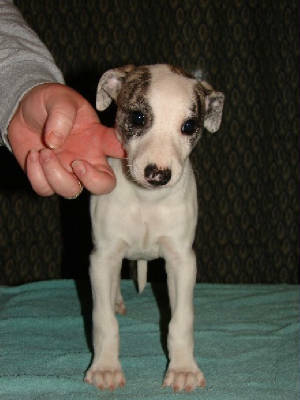 Solo is looking more like a whippet pup and less like a piggy. He is getting a little better about standing still for a moment, but I'm having a little trouble getting him to stretch out without posting. We'll keep working on it! 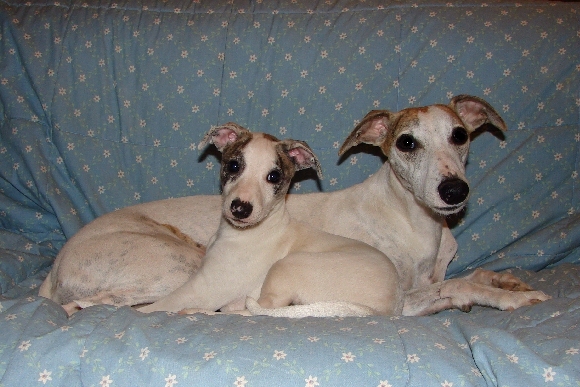 Solo had a very busy week between six and seven weeks of age! 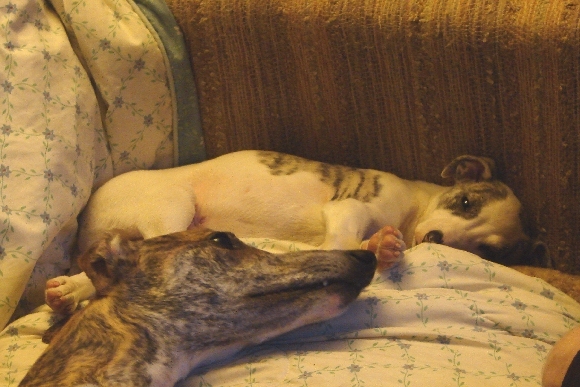 More napping - it's serious business for big whippets as well as baby ones. 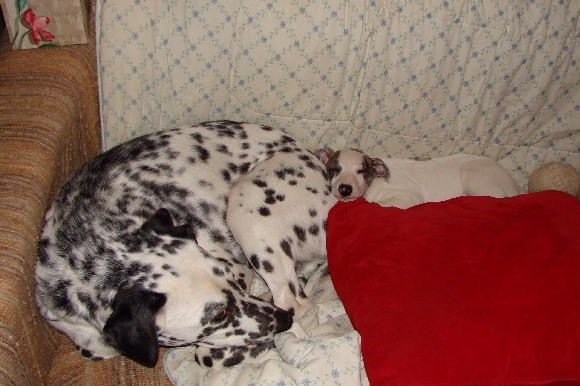 Here, cousin Spot is having a snooze with Solo. I guess he feels safer sleeping near the puppy than rough-housing with him. Dena is always nearby, keeping watch! She still spends a lot of time with him, and always keeps an eye on his play times with the other dogs, ready to jump in if she thinks they are being too rough. Seven weeks old and full of mischief, cuteness, and puppy kisses. We tried using a show lead this time, and Solo took it in stride. What a cute boy! I just love Solo's face! 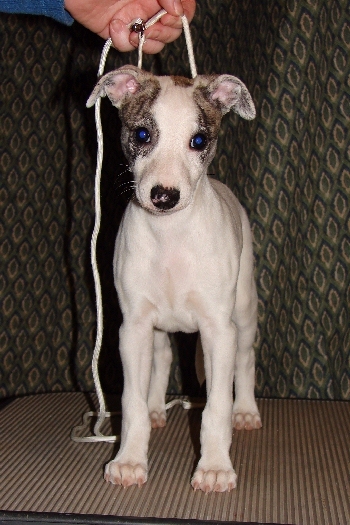 His nose pigment is filling in nicely now, and in the past couple of days his ears have started to fold like whippet ears are supposed to. We think he's gorgeous! No worries, though! Solo came right back with a fierce-looking attack! It's so funny to hear his little puppy growling and barking - so scary! Sal has amazed us with his gentleness and patience with Solo. He really seems to love to play with the pup. 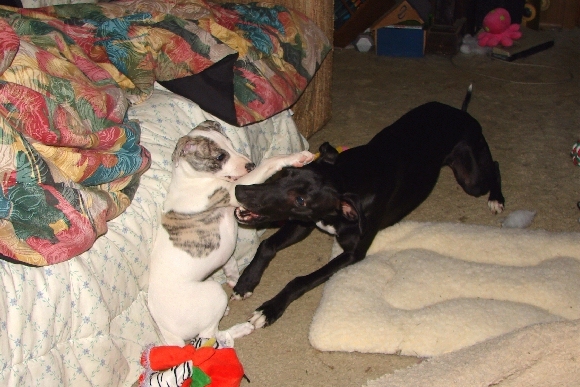 Puppies need a lot of play time, too, and Solo enjoys playing with his two-year-old cousins, especially the lovely Mazie. She plays with him much more than the boys do; they still seem a little afraid Dena will fuss at them for going near her baby. 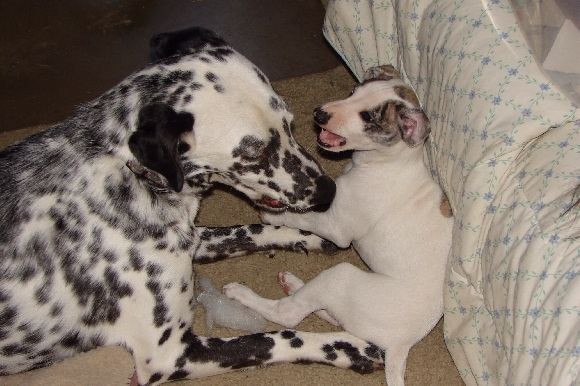 Of course, Solo still loves his mama best of all the grown-up dogs. 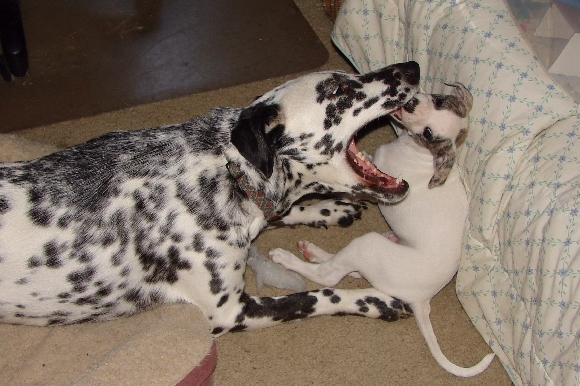 Dena plays and wrestles with her little son, too. Doesn't she look proud? This photo isn't very good of Dena, because her head is thrust forward, but it's so cute of Solo, I love it anyway! 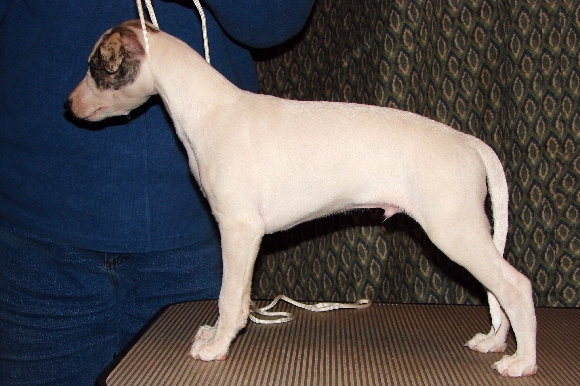 - And here is the front shot of our sturdy little guy at seven weeks. That darling face grabs my heart and won't let go - but that's just fine with me! one - two weeks old.